By Srinivas Chowdary Sunkara // petrobazaar // 6th Dec, 2018. 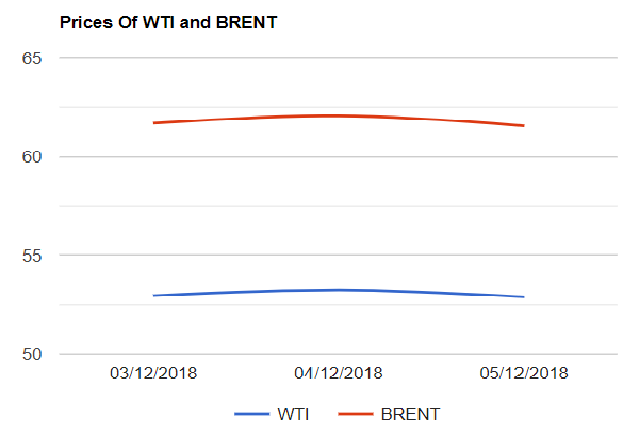 Brent closed down by 52 cents to $61.56 after reaching earlier session high of $63.29 and a low of $60.80 while WTI settled down by 36 cents to $52.89 after touching a high of $54.44 yesterday. Both the crude futures prices closed lower as the global investor awaited clarity on possible cuts by producer's club. EIA confirmation on API numbers is awaited and the government numbers got delayed by one day. Let us focus on Vienna today. OPEC and its allies started working on supply cuts to avert building global oil inventories. After yesterday's JMCC meeting, All the producers including Russia agreed that there is a need to cut supplies in Jan from Oct-Nov levels. Volumes and baseline for the cuts are to be debated in today's meeting. Saudi, The de-facto leader of OPEC, strongly working on deeper cuts and urged other members to be on board but Russia is playing tough. Russia may be in favor of 1.0 -1.1Mbpd cut. Trump maintained pressure on Saudi to limit any production cuts to preclude significant price advance from the current levels. Asian markets are trading low today. Good day.